Fenway Printers is co-owned by Todd Nugent and Rick Sands, who purchased the company about six years ago. Combined, they have more than 30 years of professional print and graphic design experience. Todd directs print center operations. The print center features a staff of 10 professional printers. Before Fenway Printers, Todd spent more than 16 years in the printing industry servicing medical accounts. Rick Sands directs Sands Creative Group, the Boston area's leading visual marketing company. Sands Creative Group is a marketing-driven graphic design firm that helps clients explore new design concepts and create award-winning printed materials that require the unique capabilities of its team of top-caliber professional--graphic designers, wordsmiths, and marketing strategists. Sands Creative Group's headquarters is located upstairs from Fenway Printers on Brookline Avenue in Boston. Fenway Printers also recognizes that a company is only as good as its employees. We boast a well-trained, professional printing staff that takes pride in their work. Our employees stay with us for many years, breeding a familiarity with clients and their projects that help Fenway Printers maintain the highest quality and service standards. 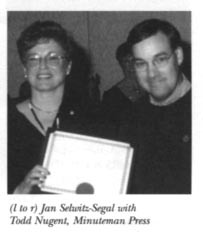 Photo: Todd Nugent, co-owner and Vice-President receives an award from Jan Selwitz-Segal from Forsythe School for Dental Hygienists (May 2002) for outstanding work done in conjunction with Forsythe.